Rekord is the new exhaust for scooters designed by Giannelli Silencers. Streel legal, with hand-made muffler with transparent coating, Rekord systems have an aluminium silencer with laser-etched Rekord logo. The special design endcap hides completely the endpipe, giving a unique racing look to the exhaust. Depending on version, performances are increased also using the variator rolls given in the fitting kit. E' l'evoluzione della celeberrima Shot. La principale novità di questo scarico è il diametro del silenziatore, passato da 60mm a 70mm, che ha consentito, insieme ad altri accorgimenti, di "regalare" da subito più di 1Cv di pura potenza (raffronto con la Shot - test al banco). Inoltre il raggio della curva di raccordo è stato aumentato per ottimizzare i flussi dei gas ed aumentare così la coppia ai bassi e medi regimi. Il nuovo logo "Shot V2" è inciso laser sul nuovo silenziatore anodizzato titanio. Come parti di ricambio sono disponibili i silenziatori anodizzati denim e nero ed il preformato silenziante Acoustapack®. CR Extra exhaust use the Extra muffler, but chrome-plated. An high level exhaust, CR Extra have a really competitive price. Muffler is hand-made and the inner perforated-cone structure is designed to offer the best performance within noise limits fixed by European standards. 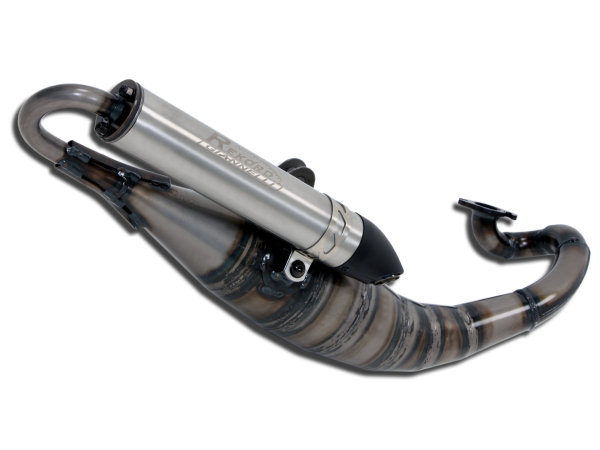 Reversed silencer is made in carbon fibre and its exit pipe is chrome-plated. Depending on versions, variator rolls are included in the fitting kit. The “Extra” line of exhausts is a of high quality product with an excellent quality/price relationship. It is homologated according to EEC parameters and is made for all models. Its main body is built according to the most sophisticated robotic M.I.G. welding process. 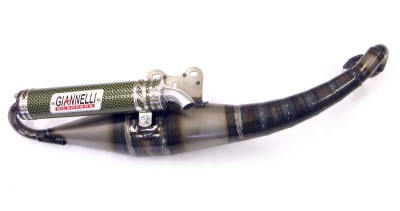 A perforated counter cone specifically designed to enhance the exhaust’s performance is placed inside in order to obtain the best performance possible for a street legal exhaust. The exhaust’s terminal is reversed. 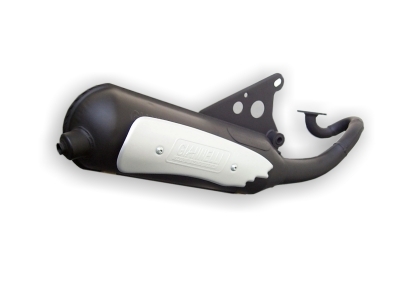 The silencer is made of carbon and has a chromed end cap and tail pipe. These details give the exhaust an aggressive and sporty look, whilst maintaining the level of noise emissions within the limits established by European laws. The replacement of stock transmission springs and rolls , for only some models, with the ones included in the exhaust kit, will further enhance the scooter’s performance. Go is our scooter exhaust line aimed at those who want a not so expensive exhaust that performs better than the scooter’s stock exhaust. It is available in two versions: the racing version and the EEC homologated version. It is completely made with stainless steel and assembled by robots using the M.I.G. welding process. Built inside is an internal silencer designed to offer the best compromise between noise containment and performance. The final touch is given by the aluminium heat shield. Our new exhaust line for scooters called NEXT (with street-legal EEC homologation), is characterized by its excellent performance and it acceptable price. The body is made using a hydraulic press and special moulds and is welded together by robots using the M.I.G. technique. Externally, the exhaust is protected by the same transparent varnish used in superbike competition. 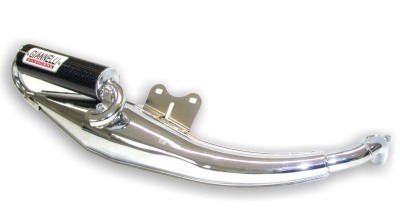 The exhaust is completed by an efficient silencer in glazed aluminium with a chromed end. The “Shot” series is Giannelli Silencer’s state of the art line of racing exhausts. These exhausts are designed to improve the performance of all scooters with modified cylinder group and upgraded carburettor. They are composed by a handcrafted expansion body assembled using oxyacetylene welding processes, and by a reversed silencer made of carbon fibre. 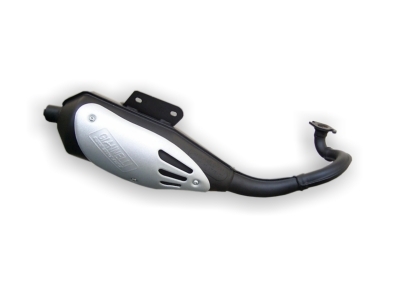 The exhaust is made of high quality steel which makes it very resistant while reducing its weight of about 60% compared to the scooter’s stock exhaust. All the components of these exhausts are handcrafted in order to guarantee maximum care to all the details.